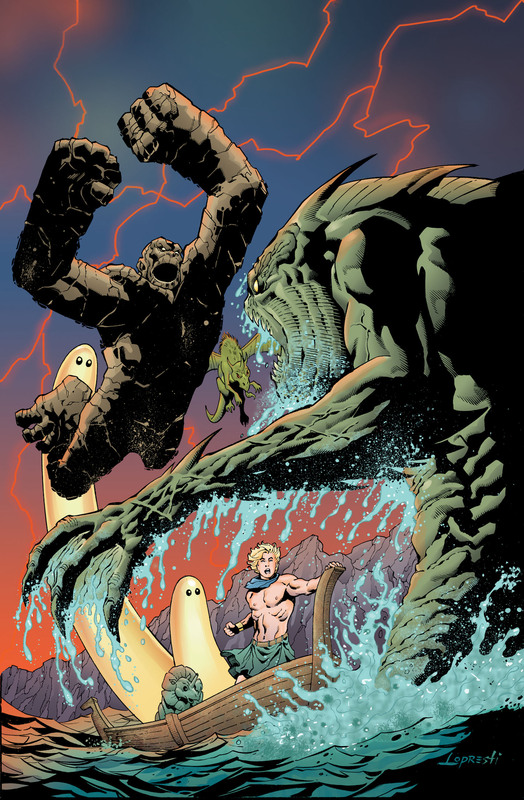 I just got my comps today for Future Quest Presents #9, the first part of my 3-part Herculoids story. This made me realize that I was way behind on posting my cover process for the second issue of the story (that would be FQP #10). Because there is probably nothing cooler than drawing the Herculoids, I wanted to make sure that I came up with some cool cover designs. 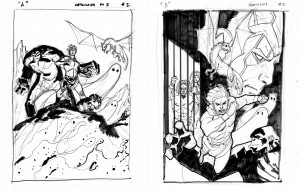 My enthusiasm led me to ink the roughs as well. A and C were my favorites, so I was more than happy when DC chose “C”. 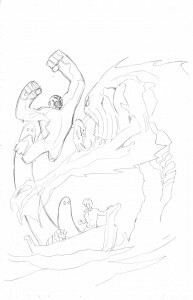 Penciling always comes before inking so it made sense to me to go ahead and pencil the cover first. 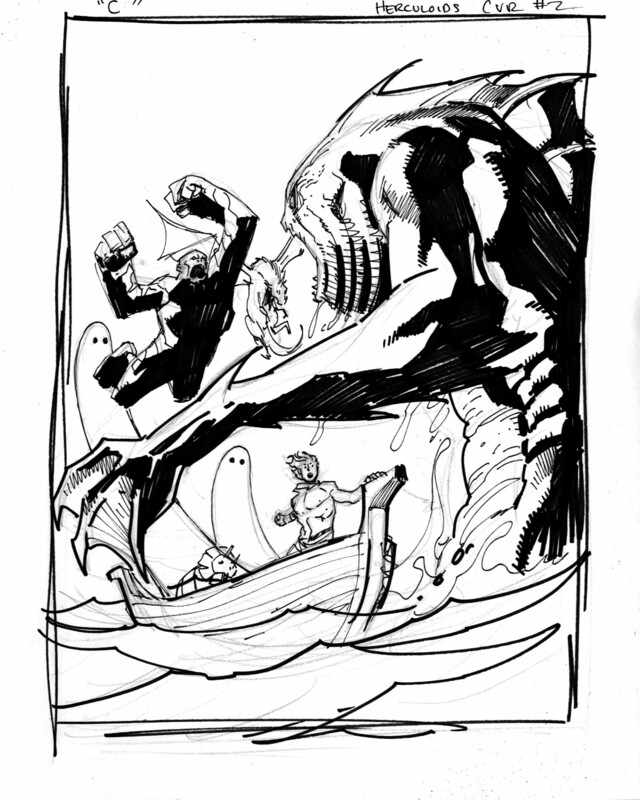 The first thing I did was blow up my small rough sketch and light table (trace) the sea monster onto the cover board. I really liked the pose in the rough and didn’t want to redraw it completely and risk losing what I felt was the perfect pose. I didn’t do too tight of a pencil on the rest of it, although I can’t really remember why. I usually draw everything exactly the way I want it before inking but maybe I was feeling overly confident. 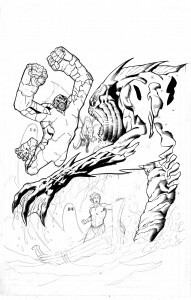 So got about halfway through the inking process…. …and realized Igoo was too small! Ugh. 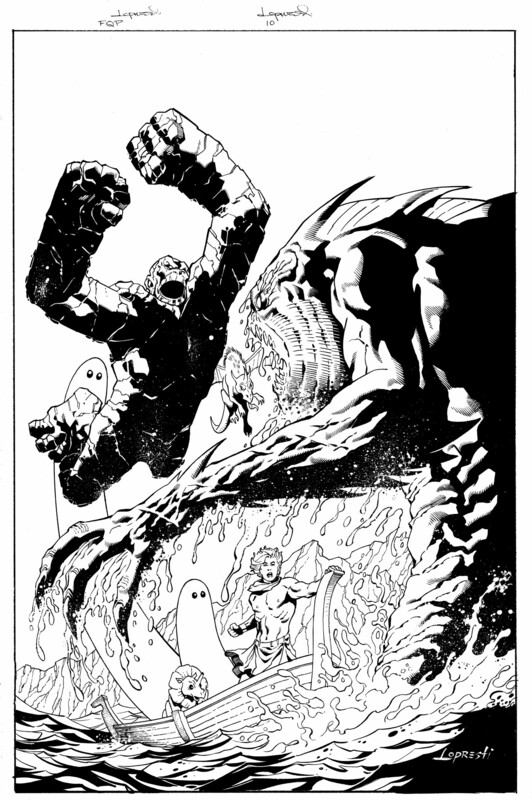 So I scanned the image, resized Igoo, printed it out and then light tabled it again onto a new board. Satisfied it was finally right, I inked it again. Mostly with a brush, as usual. 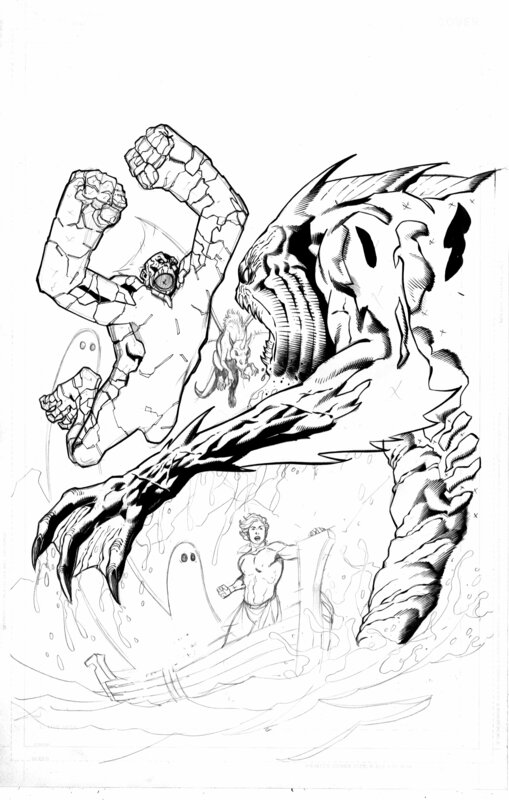 I decided just prior to this to add some land behind the scene but really fleshed it out here in the inks. 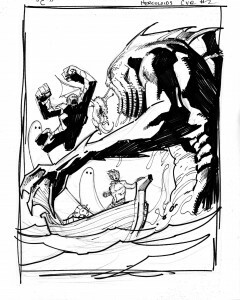 If there was ever any doubt about the Wrightson influence in my work, take a close look at the sea monster’s hand and forearm. It was inked, I was happy with it, so I moved on to color it in photoshop. The background was like so many of my covers, was a process of experimentation. I wanted an alien and turbulent sky, so I used a dark blue fade from the top into a red/orange at the bottom. I then went in with a brush tool and added splashes of color in the sky. I probably used about 35% opacity on the brush so the color would integrate better into the background sky color. I then took the pencil tool and drew in the hot orange lightning. I went over that with the airbrush tool to give it a slight glow. I then used a color hold (or fill) to eliminate the line work of the water splashes and drips. Another cover completed. Someday I may actually learn to do it right the first time and eliminate some of the extraneous work I seem to regularly create for myself. But I will say I am happy with the final product and this is one I will be keeping. Until I get motivated again to post, see ya!